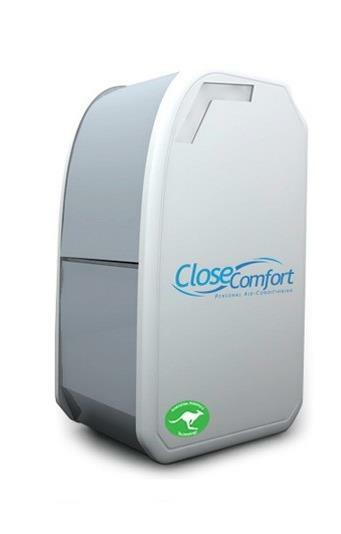 Introducing Close Comfort Personal air conditioner. A portable, ultra energy-efficient personal air conditioner that uses just 350 watts ( the power of two ceiling fans) no exhaust, no drainage, no recharge. 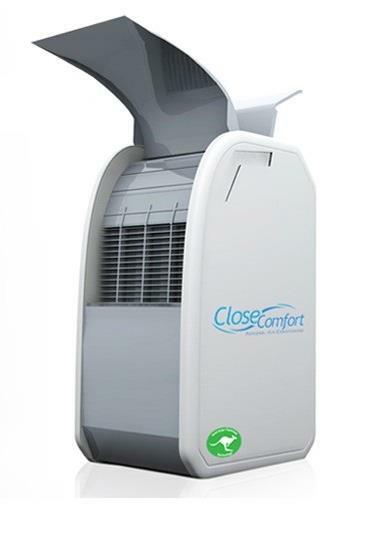 Australian professor James Trevelyan, has engineered a revolutionary new ultra energy-efficient portable air conditioner called Close Comfort that uses less than 350 watts to operate. That's approximately 15 percent of the energy used by conventional air conditioners and approximately the same amount of energy used to power two ceiling fans. It allows for effective cooling for up to 2 persons while using an extremely small amount of energy. It also means that Close Comfort can be used on a typical domestic UPS, and even on alternate sources of electricity such as solar power or small generators. Unlike conventional air conditioners, Close Comfort does not waste energy trying to cool large spaces. Instead, it uses Smart Air Flow Technology to direct cool air only where it is needed keeping users cool and comfortable even on the hottest of days. The entire unit is compact, light-weight (17 kgs) and self-contained, meaning that it does not require an external unit or any sort of exhaust piping or plumbing of any kind and can be easily transported and positioned anywhere. It also does not require any additional consumables such as batteries, water or ice to operate and its ultra-efficient compressor doesn't require any gas refills. Close Comfort can be used indoor with the doors and windows open and outdoors. Its near-silent operation and capability to run for long hours makes it especially effective in giving a comfortable night's sleep. Close Comfort's applications are limitless. It can be used privately in homes for individuals or commercially in offices, hospitals, shops and many other public areas. Its portability and energy-efficient operation ensures that it delivers quality cooling along with long-term cost saving compared to conventional air conditioners. Oops nobody like this invention....! Terrific post. thanks for sharing great technology. Good invention in the new era with best technology.